Hello! 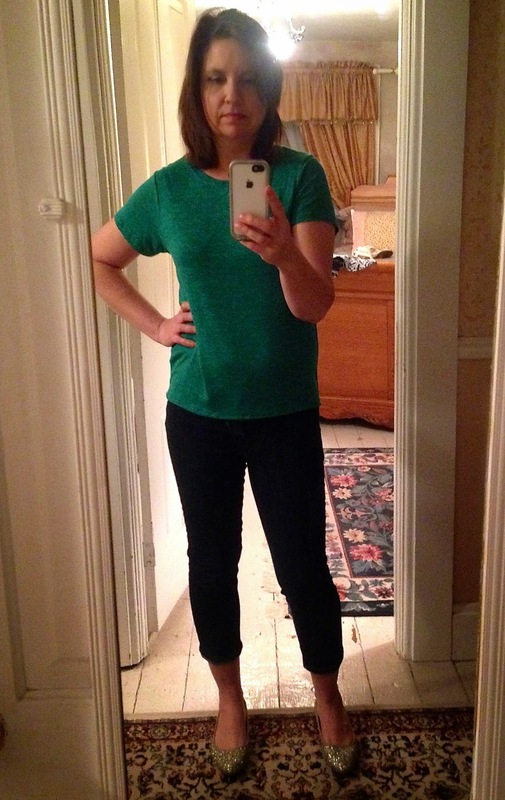 For this week's mid-week fashion post, I wanted to show you my latest Stitch Fix. 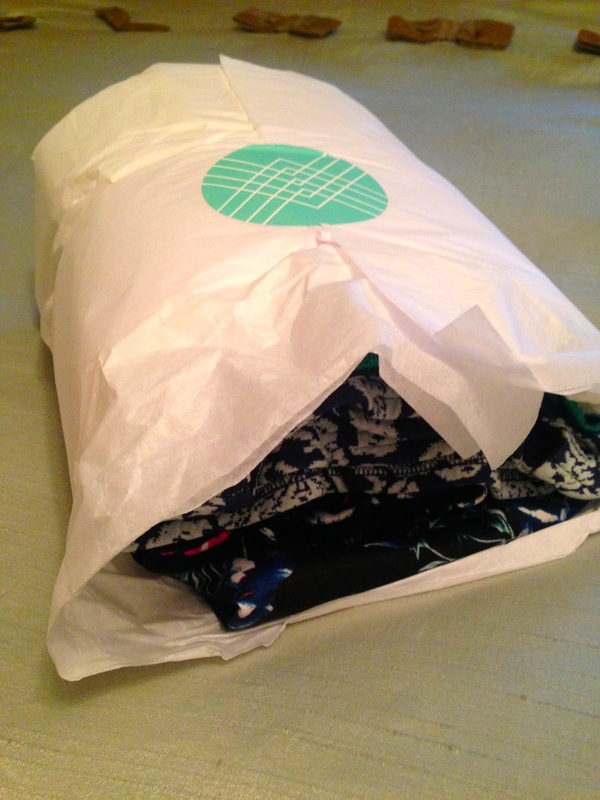 Most of my readers are already familiar with Stitch Fix, but for those of you who are not, you can read my very first Stitch Fix post HERE. 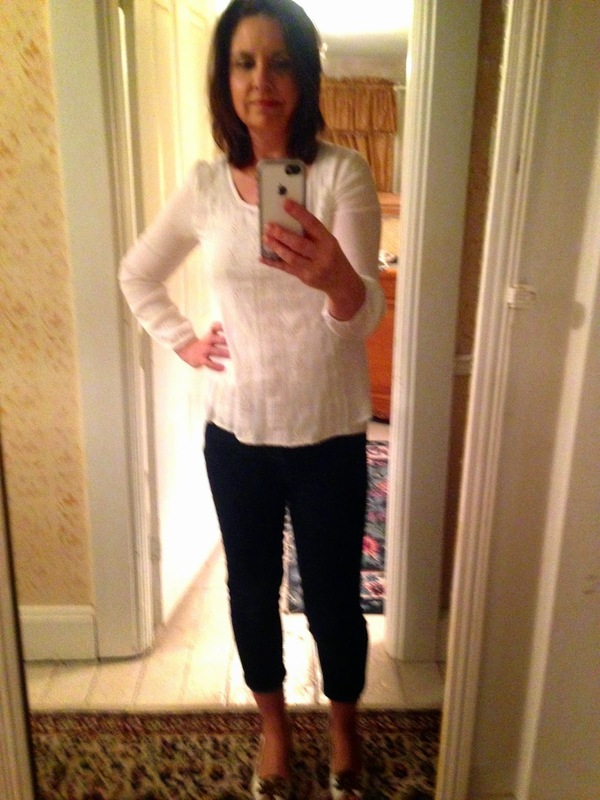 I only do Stitch Fix a few times a year, usually before a new season or a vacation, just to keep me from getting in a style rut. It helps to have someone else pick out my clothes once in awhile, or else I feel I am constantly drawn to the same styles. For this fix, I requested 'Some trendy spring items' and I linked my profile to my spring Pinterest board. As always, my items arrived in a pretty little package, and I always like to peek at the side view before opening it up. When I saw this view, I squealed with delight because I really liked what I was seeing (but not for long!). I received all clothing items in this fix, which was a first for me because I usually receive at least one accessory. I got a floral pencil skirt, a denim jacket, a brocade dress, an embroidered tunic, and a green hi-lo tee shirt. 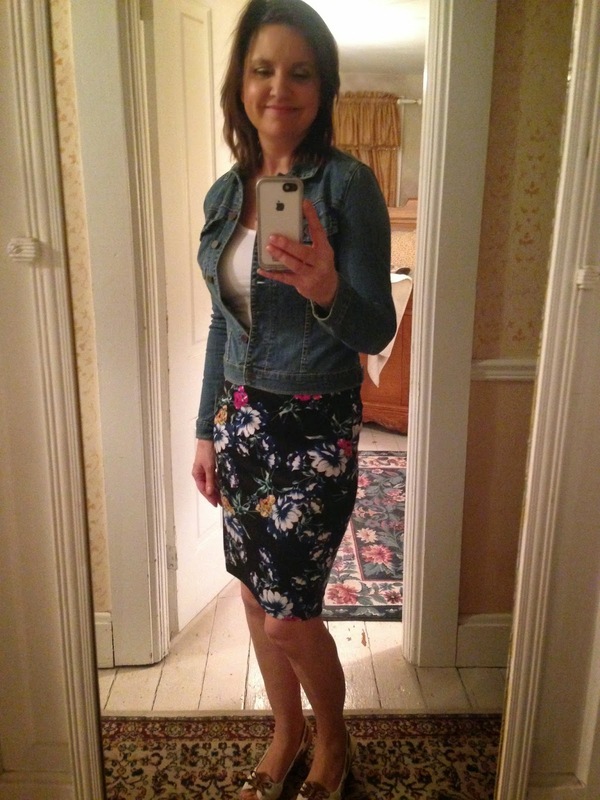 First up: the floral pencil skirt. 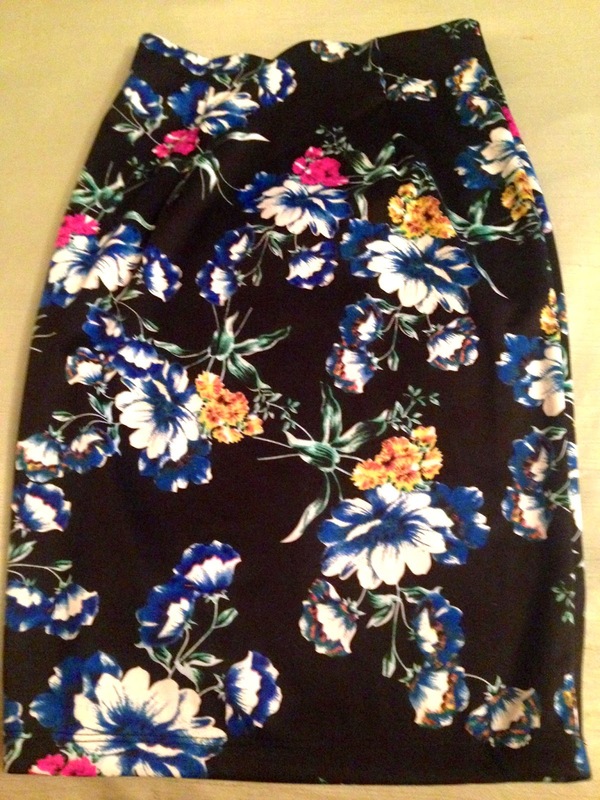 I was estactic when I saw this skirt in my fix because I have wanted a floral skirt for so long but I have yet to find one that looks good on me. However, when I put it on, that's when my happiness ended. 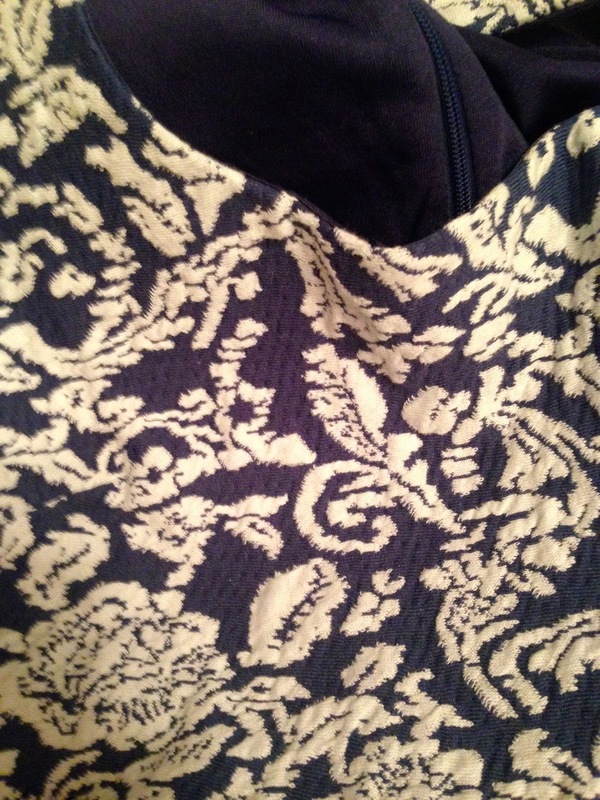 You see the print and style of the skirt is gorgeous, but the material is a very strong, ponte-roma knit. It clinged to my body like a tight rubber band and it not only felt uncomfortable to wear, but it showed EVERY lump and bulge. It was also so clingy, that I felt it was too provocative of a piece for my lifestyle, so I sent it back. This Fit and Flare dress I also really liked, but not on me. So it also went back. 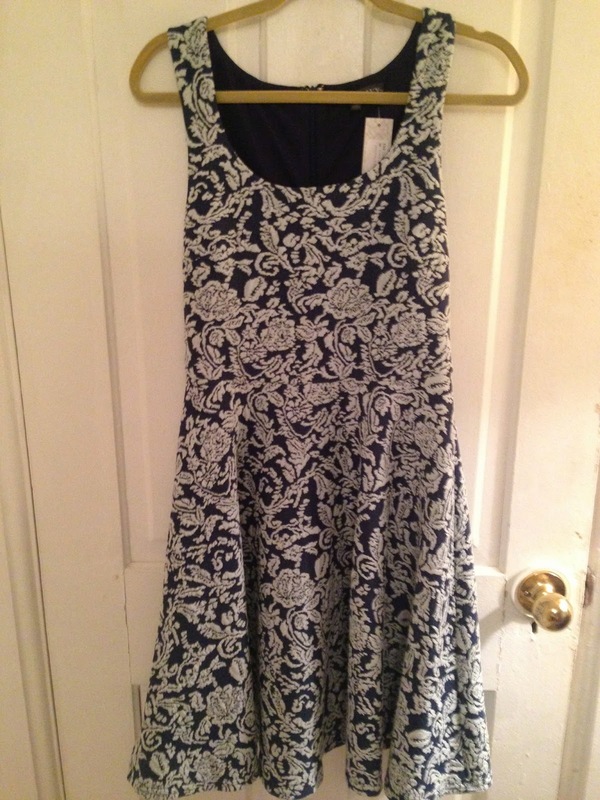 I absolutely loved the raised texture and the floral design, but if you remember THIS POST where I received another Fit and Flare dress from Stitch Fix, this cut just does not work for my body type. Look at this texture and design! It's gorgeous! If only this material was on a different style of dress! Boho has been a trend that has been in style for awhile now and doesn't seem to be going away anytime soon especially since the 70's style is going to be huge this season. I have wanted a shirt like the one I received in this fix for several seasons now, but every time I tried one on in the store, it seemed to big and baggy for me. 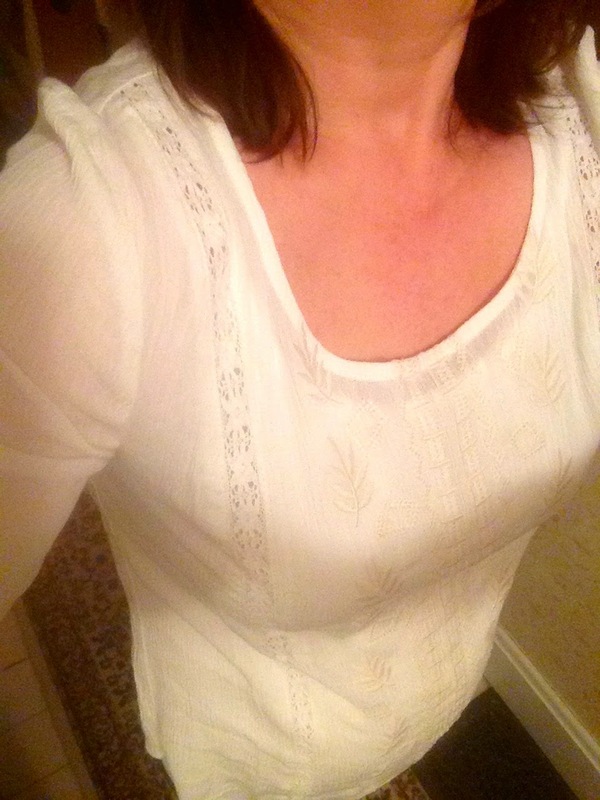 I really love this embroidered tunic I received from Stitch Fix. It had that Boho look I was looking for, but I didn't feel like I was wearing a tent when I put it on, so I kept this one! 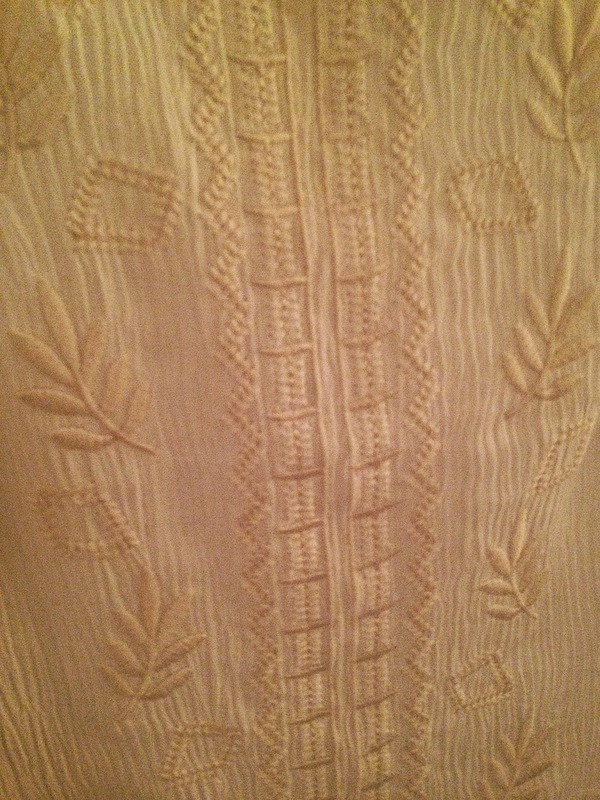 The detail in this top is so beautiful! I think because I had some denim jackets pinned to my spring board, that Stitch Fix thought I needed a denim jacket. But the denim jackets were actually pictured with other items on my pin showcasing an ensemble. I did not need a denim jacket. I already own two. So I was quite upset to see this in my fix because I knew immediately it would have to go back. 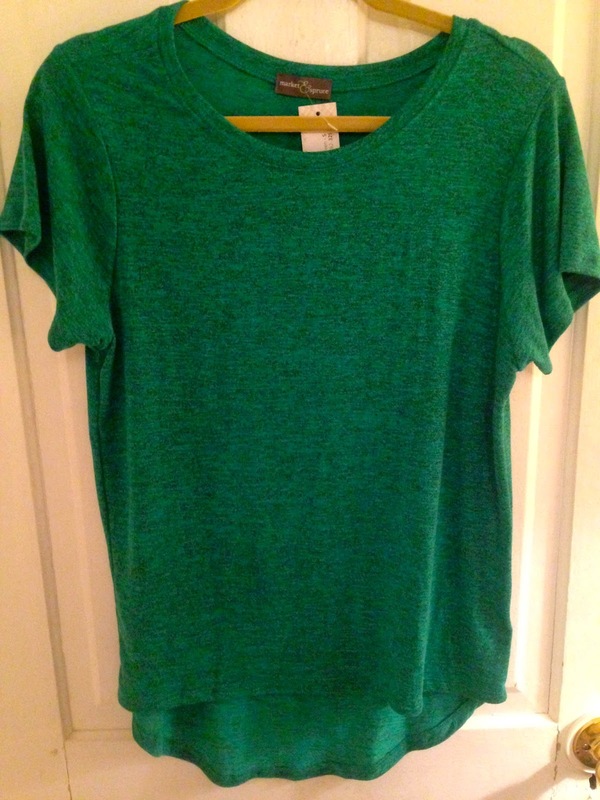 This hi-low tee shirt I kept because I really liked the feel of the material, the color, and the hi-lo cut. It also has some black flecks of color in it that makes it different than anything else I own. Now even though I only kept two items in this fix, I still tried everything on and took some Selfies before I packaged everything up and put it back in the box. 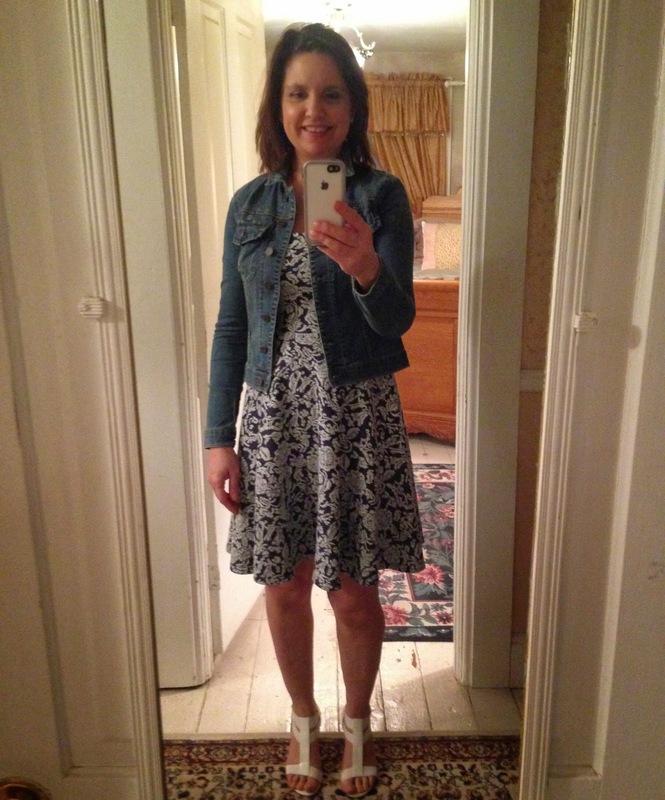 Here is the fit and flare with the denim jacket. 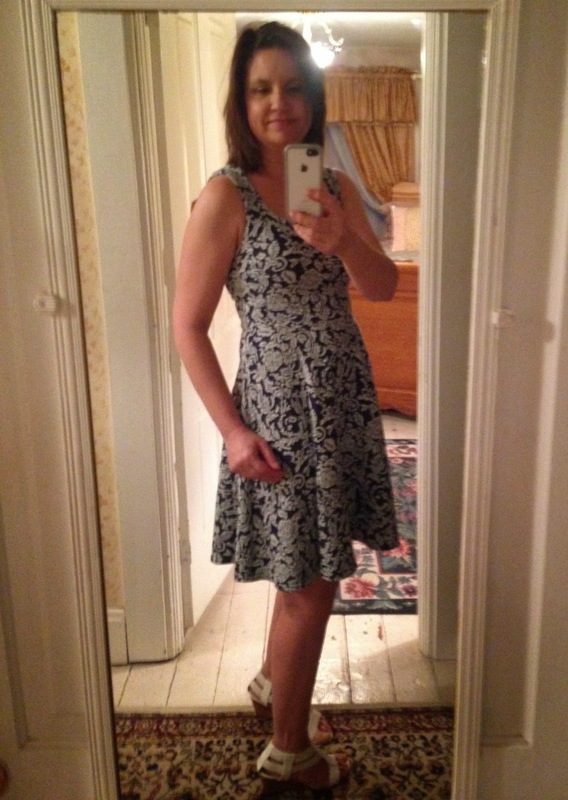 It really is a cute dress, and I almost kept it just because I liked the material so much. But in the end, it went back because I didn't think it looked good on me without the jacket, and I didn't want to buy a dress that I couldn't wear on it's own. I was actually quite mad that Stitch Fix sent me another Fit and Flare dress when I sent the previous Fit and Flare dress back stating that this style of dress does not look good on me. When I filled out the comment section for my latest fix, this time I stated 'Do not ever send me another Fit and Flare dress again! ' so hopefully they got the message loud and clear and I will never see this style of dress in any more of my fixes. This is just a simple tee, and it was actually quite expensive for a tee ($44.00), but it was so comfortable I kept it. Plus, if you keep anything in your fix, your twenty dollar styling fee is deducted from your order, so the tee was really only $34.00 then, since I kept two items. Here is a side view of the top so that you can see the hi-lo cut better. 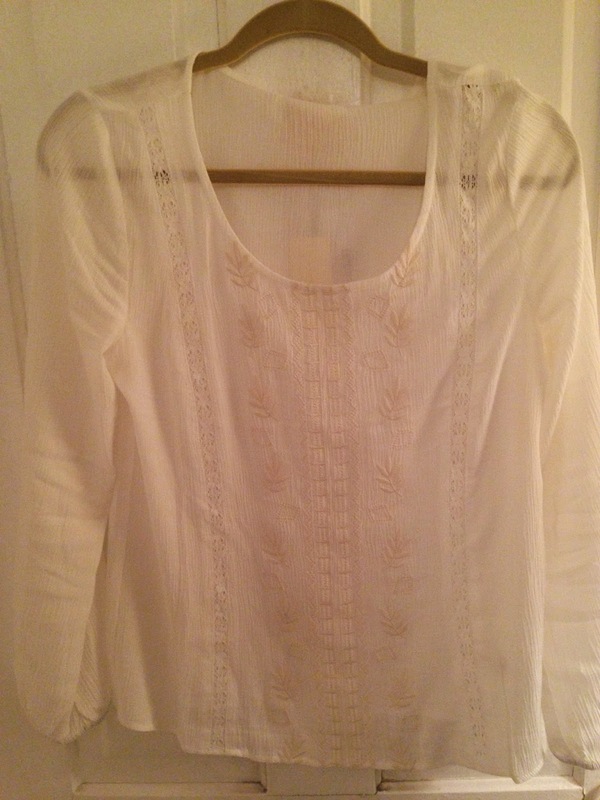 I really love the embroidered tunic and I think because it's white, it can be worn with so many skirts and pants I already own. Here I styled it with denim ankle pants and white wedges. The material of this tunic is very sheer, so I will always have to wear a tank top underneath. Now I know you'll probably look at this picture and say 'The skirt looks good on you! ', but trust me, I'm sucking in my stomach, plus hiding it under the denim jacket, because I was actually too embarrassed to even take a picture wearing this tight skirt. And as I stated earlier, it is so tight, it is very uncomfortable to wear. I couldn't wait to take it off so I could breathe again. I don't think sizing up would help either, because of the clingy material. So that was my fix, and I hate to say it, but it was my worst fix ever. I only kept two of the five items. I was upset with this fix for two reasons. One, I received an item that was the same style as a previous item that I sent back, and secondly, I requested 'NEW, spring trends' and I got a denim jacket. 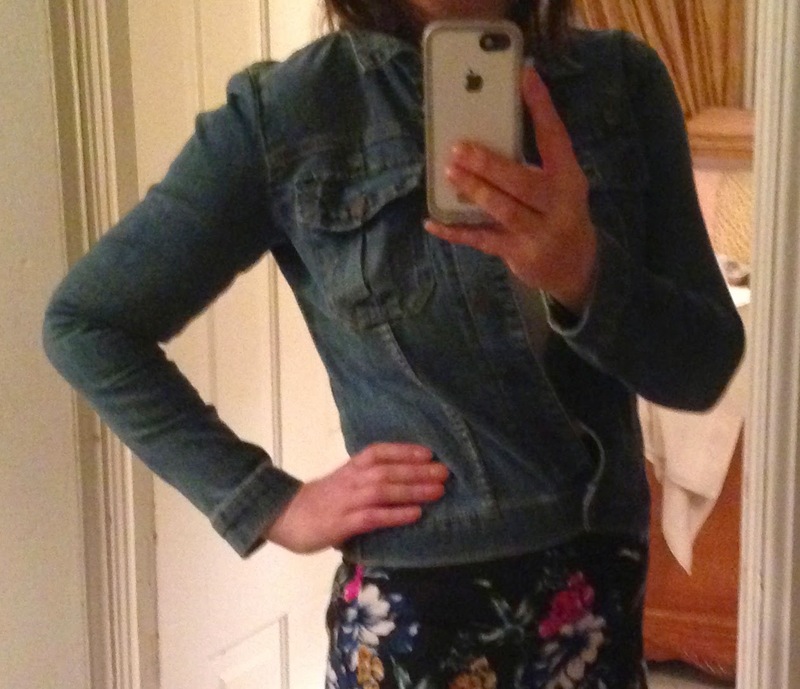 I complained to Stitch Fix about this stating 'I requested new trends and you sent me a denim jacket? Denim jackets have been popular for several seasons now. Who doesn't already own a denim jacket?' Other than that, I really liked the items in the fix. The dress and skirt were beautiful, they just didn't flatter my figure, and the denim jacket I already have and thus didn't need. I think part of my problem in my last two fixes is that I linked my profile to my Pinterest board and then my stylist thinks I need or want whatever is on my board, not realizing that those are just outfit ensemble ideas for items I already own in my closet. So I have since removed those links from my profile, and now I only have a link to my Stitch Fix board…which are items I saw on the Stitch Fix blog or Stitch Fix items other blogger's received that I liked. My next fix is scheduled for early summer, so we will see if this change brings me a better fix. So what about you. Do you like any of the items I received in this fix? Do you think I kept the right pieces? I'd love to hear from you! Sorry to hear you had a disappointed stitch fix shipment. My two favorites are the dress and the embroidered boho shirt. I do think the dress looks beautiful on your and it looks like it fits really well too!